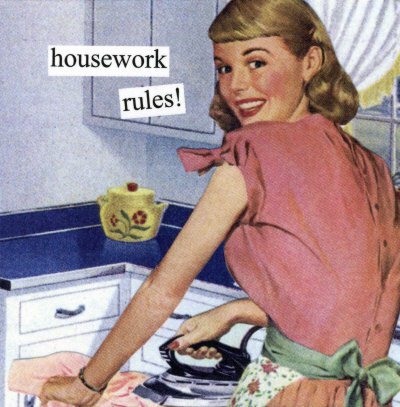 Being a SAHM (Stay At Home Mom) means “spring cleaning” is actually “perpetual cleaning”. The benefit to being a SAHM is having the time to nest, take care of your family and home. I bake bread, I have time to clean, laundry does not pile up into mountains. I make my former-self “Single Working Mom” ill, but it’s a wonderful feeling to nurture that “Mother Earth” instinct. But the downside is two-fold. Gone are all excuses to not have something done. I can no longer justify allowing dust or clutter to collect and cannot tolerate dirty dishes in the sink. Clark has been absolutely wonderful, he does not expect things to be perfect or “a certain way”. But I have witnessed the effect of having a full time Domestic Diva on call 24/7. He has become accustomed to going to his closet and having a favorite tie at his fingertips or all his shirts pressed and ready to go…. he will ask “Are you OK? Did something happen today?” If something is amiss. Also, I’m sure many SAHM coming from the working world feels a self-imposed pressure to treat life as a normal work week. I have taken my role as Chief Domestic Officer and broken it down on spreadsheets. Color-coded. Including slotted time for my “projects”…and my day doesn’t end until the kids are in bed. That’s when I “quit”, whatever isn’t complete is held for the next day (there’s a time slot for that too.) But it’s similar to being self-employed in that the hours are flexible…I get to jog with the pup and blog interruption free ! My projects ? Projects that, were I a working mom, I would not consider bothering with. I know not what made me feel the need to embark on a quest to find and taste test home-made granola bar recipes; I’ll let you know when I find one everyone will eat. Or organize all our BBQ supplies. Yes, the pantry has been systematically arranged more efficiently than any market. Next on the list is to get the cello tuned and refine my basic skills before summer vacation because Nola wants to learn. The instrument is taller than she is, but she doesn’t see that as an issue. There is of course, some “Spring Cleaning”. Washing screens and patio furniture, digging out the lawn equipment and gardening tools….Too much fun for one gal to handle ! My “To-Do List” has gotten away from me lately, I really had to kick it into high gear to get back on track. Therefore I feel deserving of a reward – a blog make-over! I decided to trade in my castle for a more contemporary abode, bringing my virtual blog home into the modern 1950’s. 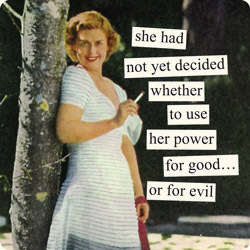 That is, of course, when evil found its way into its most treacherous form – the Housewife ! The unassuming homemaker really is Master of the Universe, sorry Conan. We control the home, the food, the finances (though we let you think you do), the children….and in many cases, the children of others. Isn’t it fabulous ? 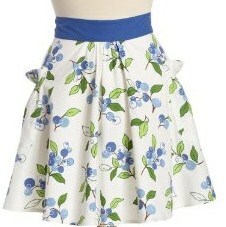 These vintage aprons are popping up all over again & I love mine. Diane has a quaint little antique shop back in Wisconsin, you can visit her here. My step-daughters would be rolling their eyes, telling me I’m being a copy cat, but I don’t care…. Girl in the Cat Framed Glasses has a new header and format, Winsomebella has a new Gravatar, and Stacy picked a new blog theme. I was not about to miss out on all the fun. I’ve also decided to change my Gravatar; which was NOT an easy decision. My former one kind of had a story behind it. 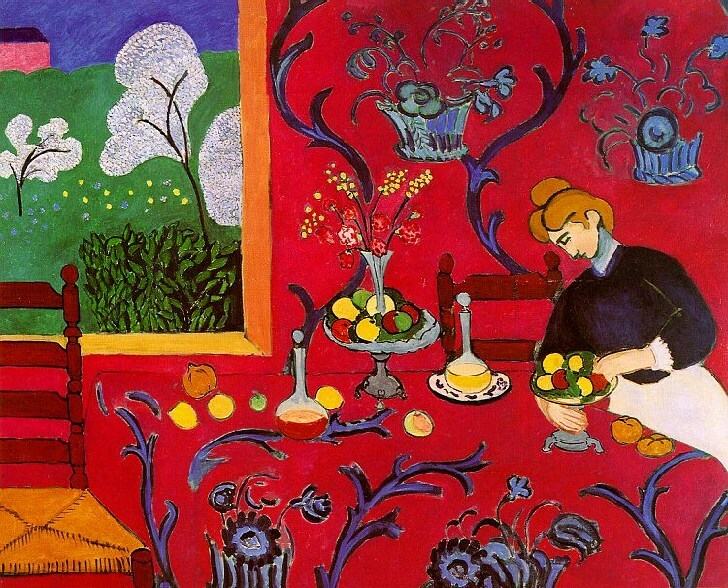 A painter took Matisse’s “Harmony in Red” painting (on the left) and injected Hello Kitty into it; when I first saw it I didn’t know whether to laugh or cry. I have appreciated works of Matisse for such a long time; and the Kitty plopped into the middle struck me as a symbol of the “All Things Cute & Pink” step-daughters that took over my life. It was my own little private joke, but I’m not sure I want to continue to portray myself as a “Hello-Kitty obsessed grown women re-living childhood and thinking it’s cute”. But I think I’ve found something that is simple and to the point…. I love the new look! Green suits you. Thanks ! Its a springy color AND the color of the Wicked Witch (bonus). I figured if I’m going to walk & talk like a duck, I should look like a duck…..
I’m so jealous! Laundry that does not pile into mountains?? If only….. I need a laundry fairy to sneak into my house and conquer the mountain! Love the look of the gravatar and blog! Very chic! I’m full-time SAHM too and sadly, my laundry still piles and my dishes accumulate. Thanks – I saw that ” Im Evil” clip and I had to do something with it ! Perfect re-do! (It is the exact green from the Wizard of Oz’s Witch…and oddly maybe what that Exorcist girl was spewing as her head spun around?) Anyway, great choice. Hope you’re not giving away too many secrets. it’s ok if I give away secrets, Im working on getting one of those amnesia zapper things from “Men In Black”…. It is the perfect retro/ witchy green isn’t it !!!! Sounds like you have the makings for a bonfire – grab the marshmallows ! That would be a huge bonfire!! Yeah! Thanks Belle – you are always inspiring; its all about taking baby steps right? Next – channel your photography flair! I noticed – and adored – the new gravatar immediately in the “Blogs I Follow” list. Very nice. I need your organizational skills! Also, I’m loving the last picture. I’m inspired to take a photo similar to it in the near future. “I’m evil” is so great! “You just think you wear the pants” is even better! When I saw that photo, I couldnt change my gravatar fast enough !!! Maybe what this country needs is a group of housewives to balance the budget – we could do it …. I’m with ya – & i think its ok to ‘criticize’ the culture they were brainwashed from birth to accept ! thanks, appreciate your input ! You get way more done in a day than I do. Stop it with all your color coding. But as far as colors go, I do love the green. And the new you. Thanks, so appreciate your feedback ! & yes, I need to find a 12 step program for the spreadsheets…. This post makes me nostalgic for my days as a SAHM. Often I wonder why I ever decided to go back to work! What I wouldn’t give for a clean house and the excuse to tinker with homemade granola bar recipes! I’m guessing it was a desire to interact with the real world, experience a sense of accomplishment….a paycheck….just a thought 😉 Thanks for stopping by ! I want to be a SAHM too after reading this. Too bad I don’t have any kids. Just a new brand new puppy – would that count? I love your new gravatar! Have fun with the blog makeover.